I'd like to kick off this thread with the line I hate the most from a film ever. Start Wars Episode 2 wrote: Padme: We used to come here for school retreat. We would swim to that island every day. I love the water. We used to lie out on the sand and let the sun dry us and try to guess the names of the birds singing. Also this quote was directly below the previous quote on its own on the page I stole this from. I'm not sure why you'd include this in a list of quotes. Star Wars wrote: Obi-Wan: You're sweating. But Star wars has to have cheesy lines, as it's predominantly a cheesy movie. I think picking on the new films is a bit like beating a dead horse with a stick and then poking it's eyes out for funsies. Those lines aren't cheesy, they're a disgrace to screen play writing. I'd say an example of good cheesy writing would be the speech from Independance Day, it knows its cheesy and holds nothing back. Whereas George Lucas actually thought those were good lines to write at a point in the plot that was clearly intended to be a thoughtful, intimate examination of the character's relationship. This also begs the question as to why he was even trying to put serious and intimate scenes in the film. In the original films this was avoided by having the characters look at each other longingly, for a few brief seconds, and then moving the scene on to Darth Vader saying something damn evil while plastic people run around. Independance Day wrote: Good morning. In less than an hour, aircraft from here will join others from around the world. And you will be launching the largest aerial battle in the history of mankind. "Mankind." That word should have new meaning for all of us today. We can't be consumed by our petty differences anymore. We will be united in our common interests. Perhaps it's fate that today is the Fourth of July, and you will once again be fighting for our freedom... Not from tyranny, oppression, or persecution... but from annihilation. We are fighting for our right to live. To exist. And should we win the day, the Fourth of July will no longer be known as an American holiday, but as the day the world declared in one voice: "We will not go quietly into the night!" We will not vanish without a fight! We're going to live on! We're going to survive! Today we celebrate our Independence Day! As long as the skeleton of that horse remains I shall continue to heartily thrash it. indeed independence day was craptacular. I like American propaganda as much as the next guy but this was pretty ridiculous. Obviously Luke loves it, its got will Smith in it so how could he not. Also i am pretty sure any line from bravehear could make this list. p.s. 200th Post!!!!!!! yeah! I demand a prize. 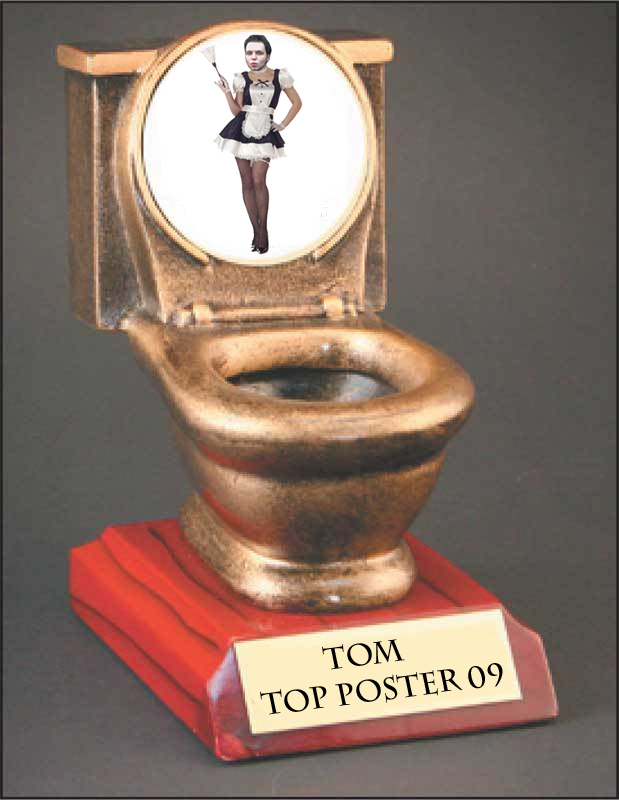 I present to Thomas Harris the 2009 Grainy Maid Service Award for Posting Lots. Although i'd like to point out that i am the top poster ever! Not just 09. I feel like i have been slightly overlooked. The trophy is pretty spectacular though. That depends how many posts you did on the previous incarnations. We'll have see what your post count is at the end of next year and I might give you one for poster of the decade. I'm glad you like the trophy. Grainy's beautiful body is what makes it if we're honest. How will you improve the trophy? You know that poster of the decade has to be AMAZING! p.s. I am ignoring your idiocy over the decade debate.